The floor of every room completes the general perception of the space. 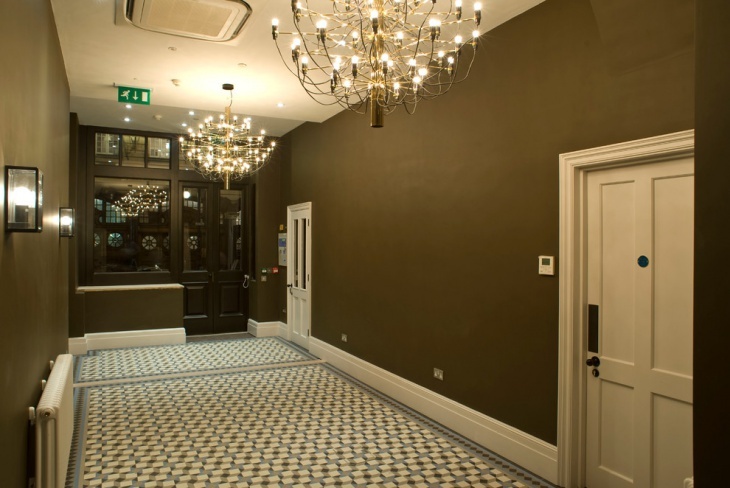 The flooring is adding to the room’s character by leading the eye to where we want it to be led. Geometric patterns can give a certain style to a room. The lines, the colors, as well as the continuous pattern, can catch the eye. Here we brought together ten geometric floor tiles ideas to get inspired and create unique flooring in your home. 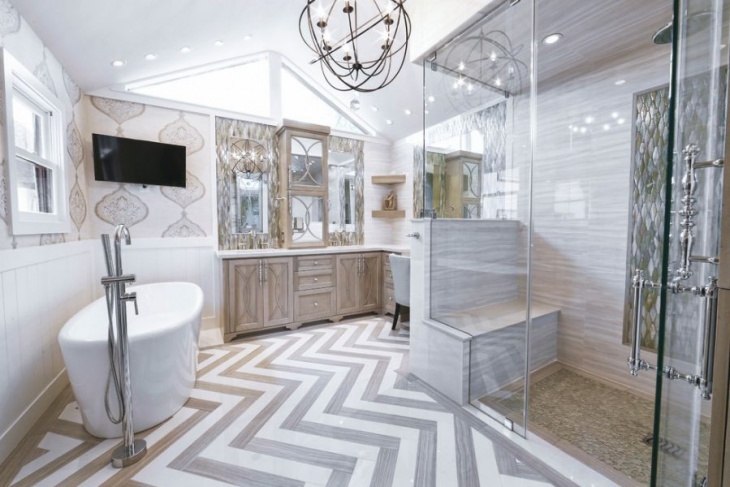 In this renovated master bathroom the use of chevron tiles five a more elegant style in this luxurious bathroom. The coloring is following the color scheme completing the room. Black and white combinations are always a classic choice when it comes to patterns. It’s suitable for neutral colored rooms or for black and white schemes. Accessories need to follow the classic style accordingly to avoid confusion to the eye. 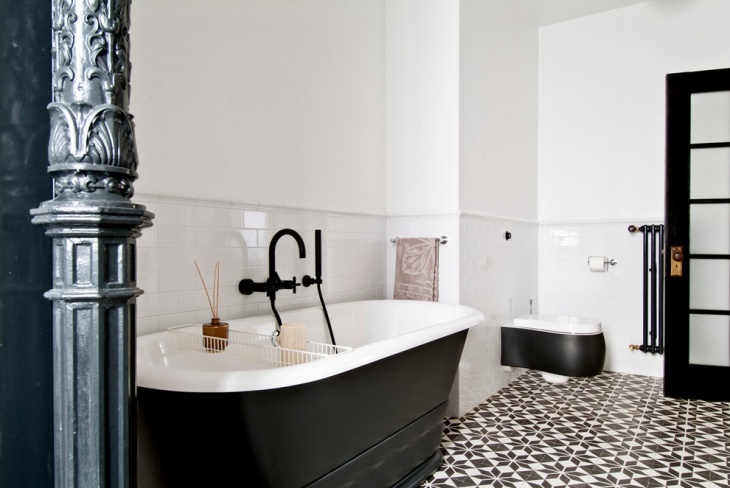 Geometric floor tiles are suitable for every room. 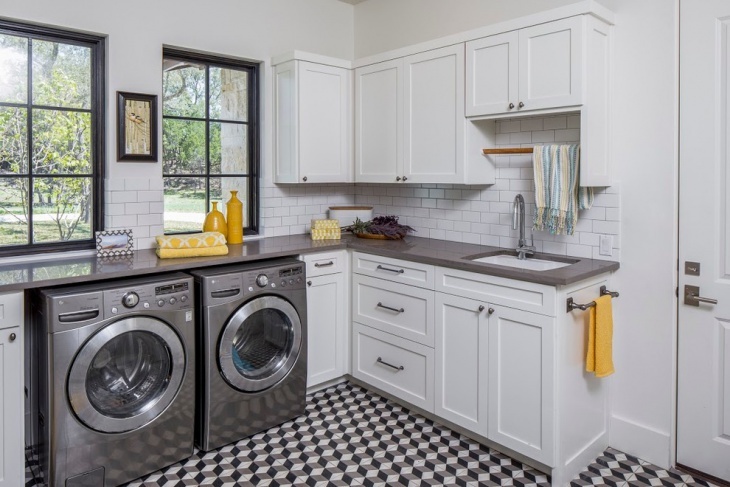 Like this white laundry room, the patterned tiles bring balance in the room, turning it into an interesting space. 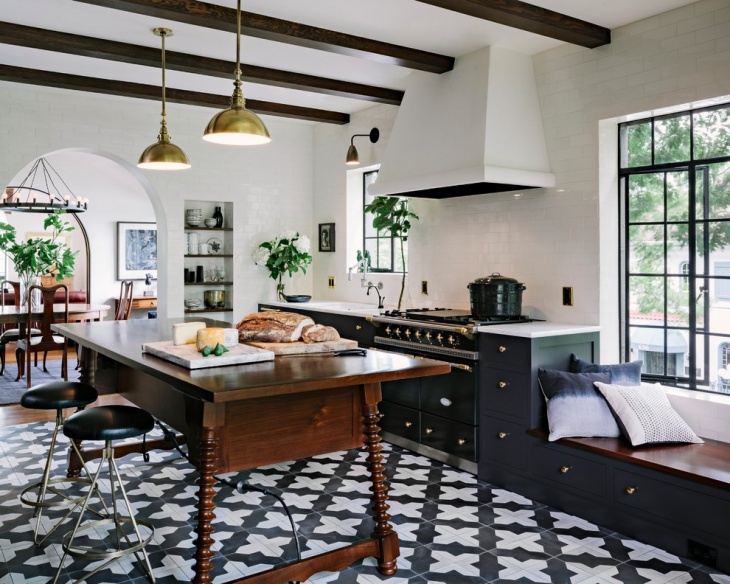 You can set the style with geometric kitchen floor tiles. 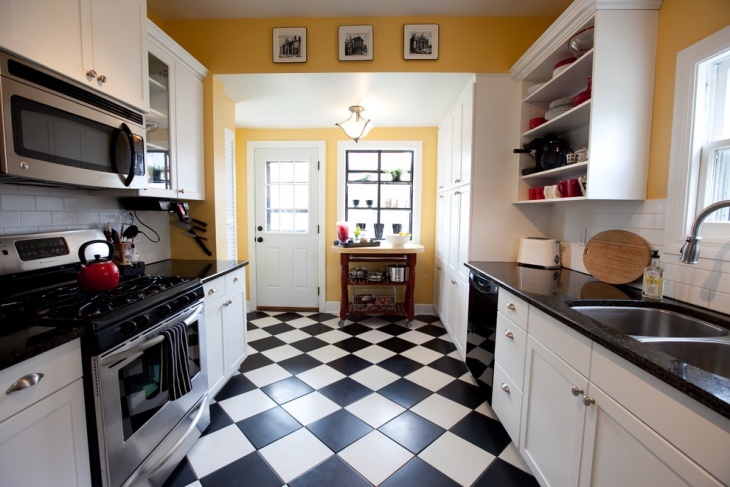 In this retro style kitchen, the checkered pattern tiles of the floor bring an eccentric atmosphere that completes the layout. The variety of the geometric patterns and colors are endless. 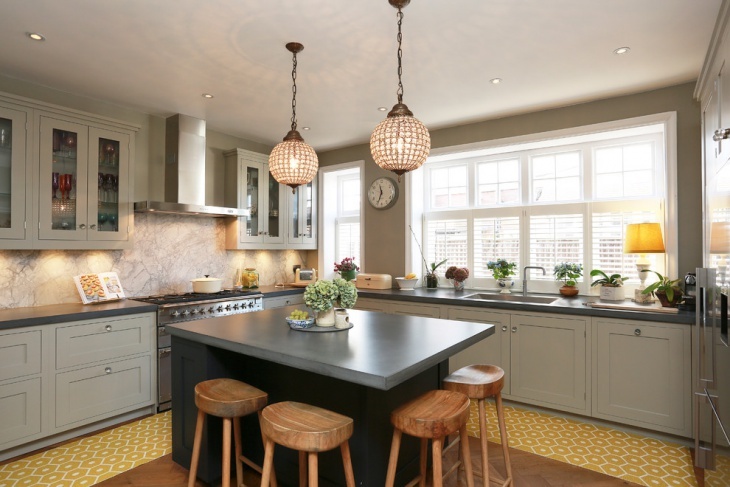 You can invest in a neutral color or you can bring a fresh point of by choosing tiles in yellow. Choosing colors that blend in with the rest of the room is essential. 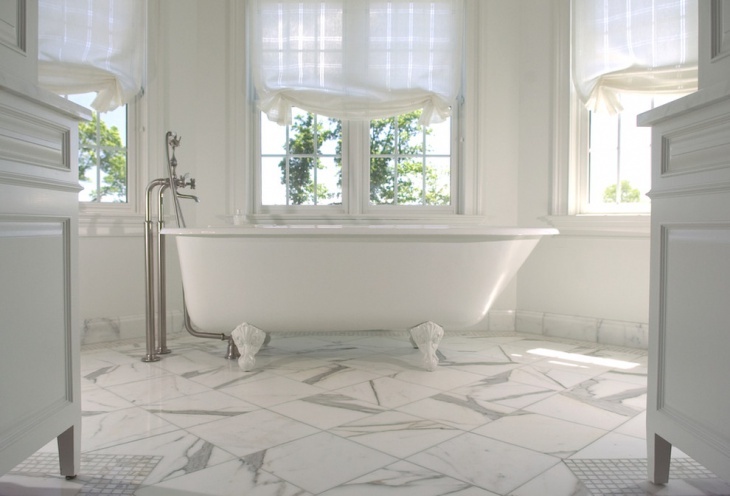 You can use geometric tiles for your favorite reading spot in the house. The continuous pattern will bring a character of elegance in your space for your reading time. Your entryway should reflect your personal style and character. 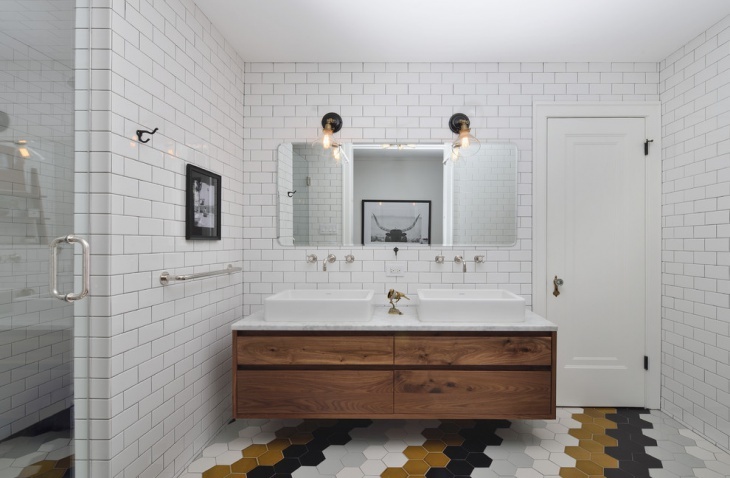 You can use reclaimed geometric floor tiles that will give a vintage style for an eccentric impression. 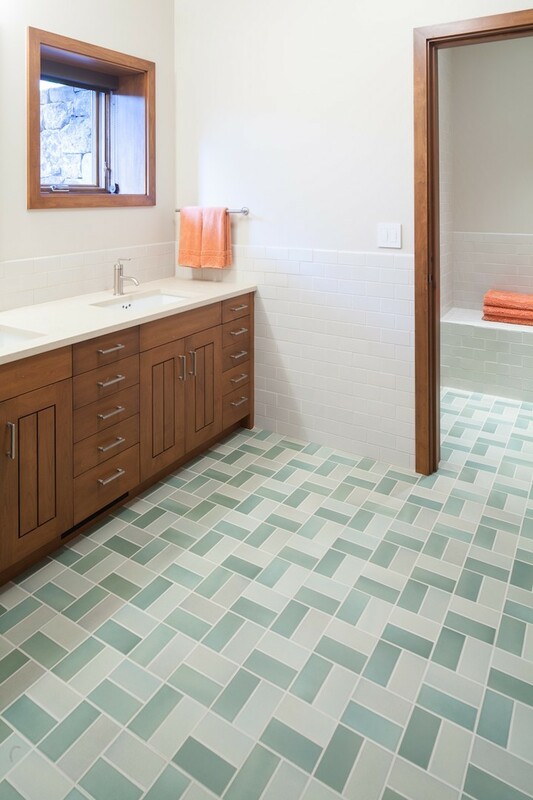 A geometric tile synthesis of different shades of the same color pallet is always beautiful and charming. 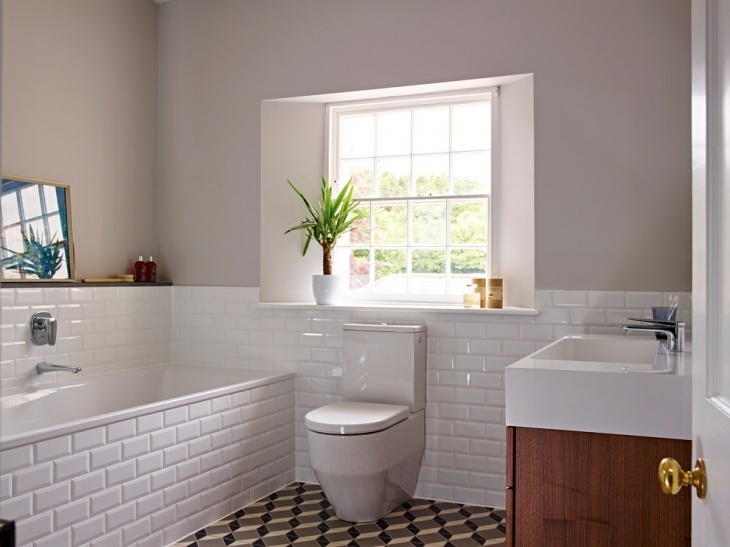 Like this bathroom in pale blues, you can create a motive by arranging the colors in a pattern. 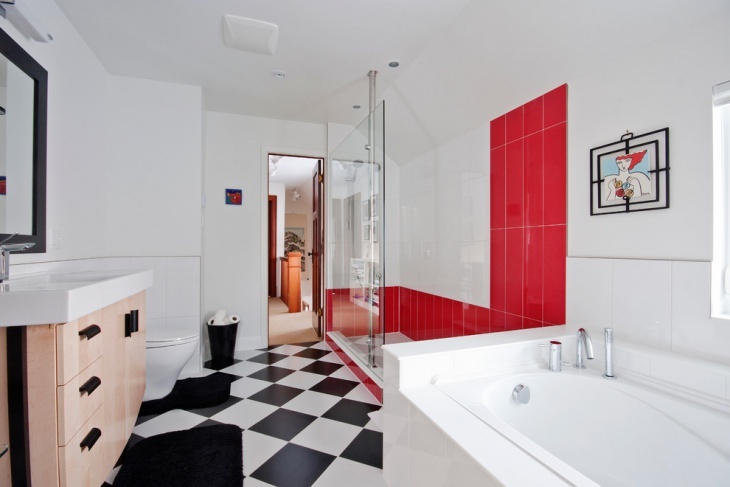 You can make a difference by choosing 3d geometric patterned tiles for your floor. The colors give the illusion of a three-dimensional flooring that catches the eye. This should be matched with a neutral coloring for the rest of the room, to avoid confusion. You have to take notice of the geometric pattern and color. 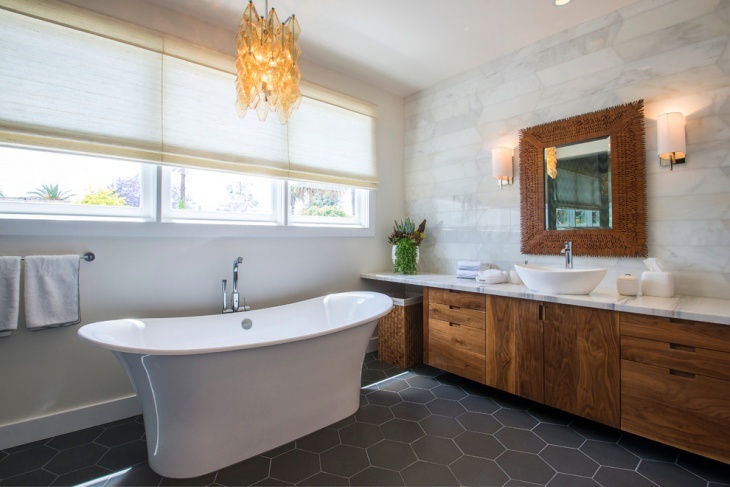 Make sure to make the tiles stand out in a room with neutral color schemes. 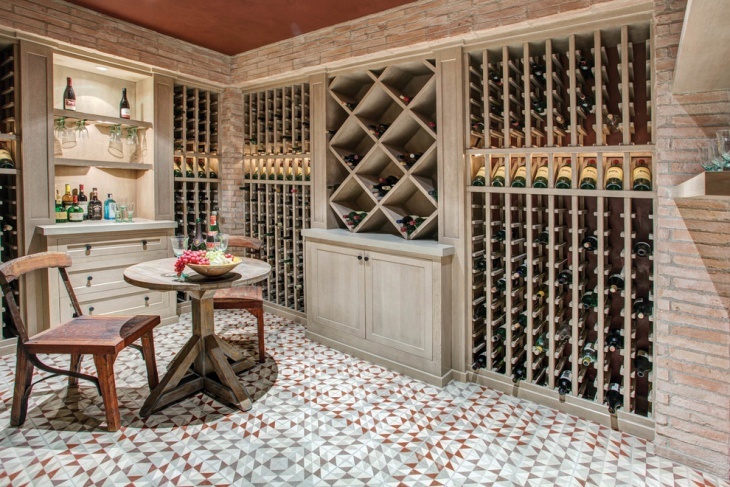 An intricately patterned floor can be confusing in a room with intricately designed furniture. Try it out in your mind. Look at pictures and do research about the style you want to achieve. If the pattern you want is going to turn to be too much for your room, then try it in a different shade and color until you get exactly what you want. 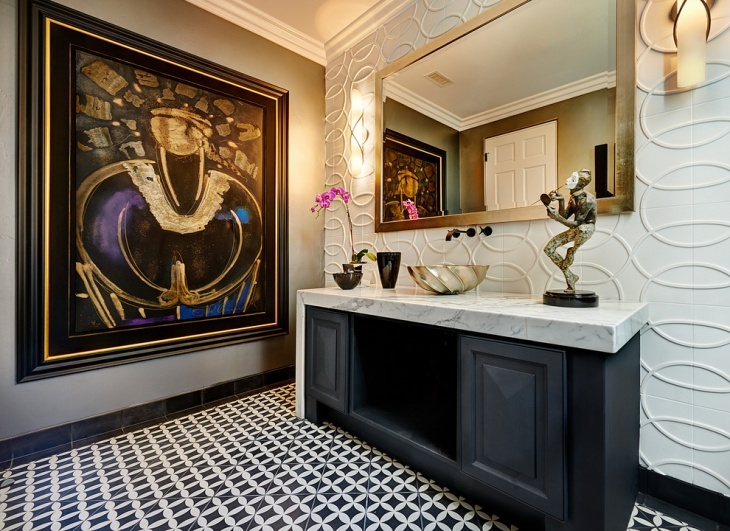 Geometric designs turn every room into a special space. The unique feeling it gives to your house will always be memorable for your guests and it will give you good points for your taste in style. 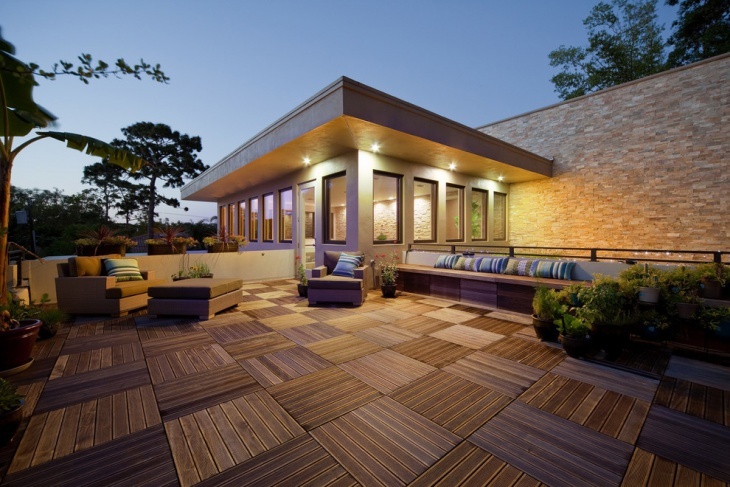 With a careful design and approach, you can create amazing flooring for your house.